Greek Store Comparison - Which Greek store is the best? Greek Store Comparison - Which Greek store is the best? 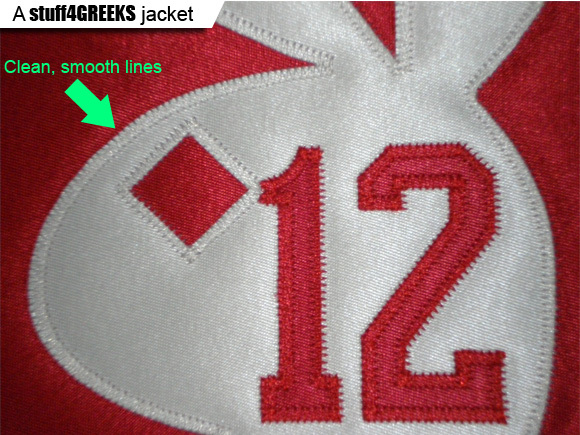 Take a closer look at our quality.A customer ordered this line jacket from another Greek vendor and asked us to make some changes to it. We were so disgusted with the quality that we decided to recreate his crossing jacket from scratch. Then it dawned on us that the average person might not even notice some of the details that we notice because we've been doing this for so long. 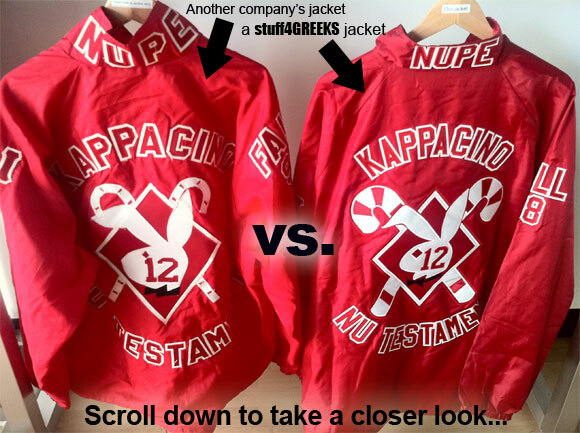 To the untrained eye, these two crossing jackets might look the same, but scroll down to take a closer look and compare the details. 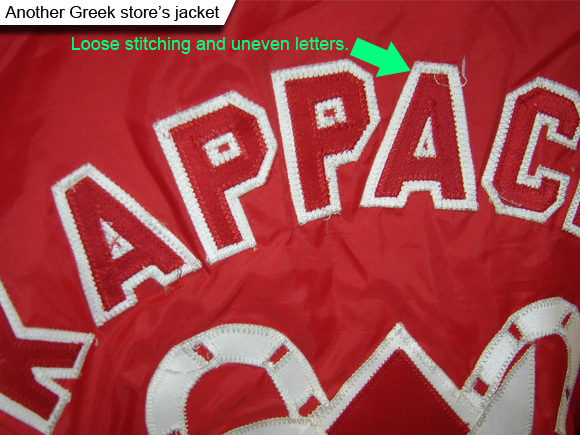 First, lets take a look at the sewn-on letters. 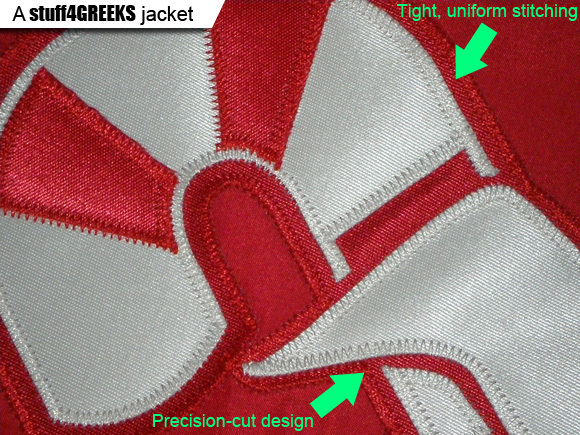 Our letters are clean and crisp with tight stitches that will last a lifetime. 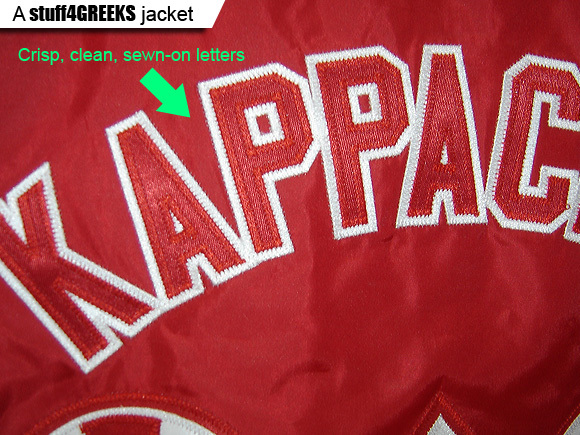 The other jacket has uneven letters with stitches coming loose. 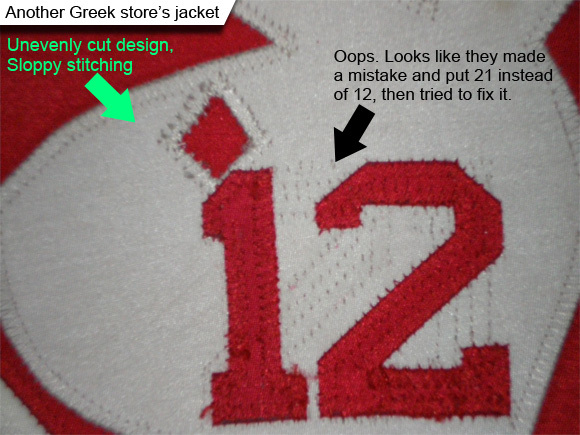 Here at stuff4GREEKS, we are unashamed perfectionists. We won't sacrifice quality and service to save a dollar and try to be the low price leader. In fact, we hate cheaply-made Greek paraphernalia. People who shop at S4G understand this and come back to us semester after semester for their Greek merchandise needs. 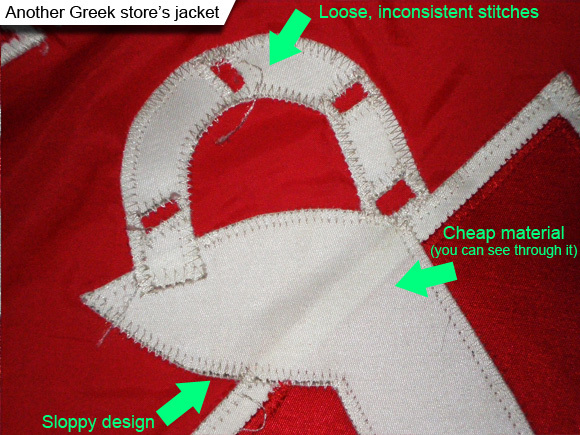 Also be careful when shopping with local individuals who claim that they make Greek paraphernalia. We've heard several cases where the vendor isn't officially licensed, the order has mistakes, the quality is terrible, or the customer simply never received their order. No matter how you look at it, nobody comes close to our quality. S4G offers superior craftsmanship, unmatched style, and outstanding creative services that other Greek stores just can't duplicate. For over a decade, we've been outfitting fraternities and sororities with the finest Greek paraphernalia that money can buy. Thank you for taking the time to read this entire post. Here's a special gift for you: Use code ILOVES4G to save 20% right now. Offer details: Requires $75 minimum purchase. Cannot be combined with other discounts or used on items that are already on sale. Limited time offer; may expire without notice. SHOP NOW.